Pompeo calls Duque to soothe Colombia's president after Trump's dump? 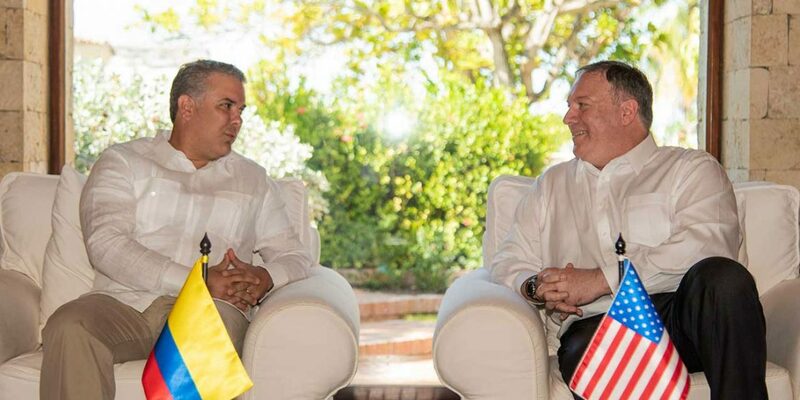 Pompeo calls Duque to soothe Colombia’s president after Trump’s dump? The United States’ Secretary of State Mike Pompeo had a phone call with President Ivan Duque Monday in what could be an effort to smooth over US-Colombian relations after a surprise attack on Duque by US President Donald Trump. “The Secretary and President Duque discussed the importance of continuing joint actions to reduce coca cultivation and cocaine production in Colombia, including increasing eradication and operations against drug trafficking networks,” Robert Palladino, deputy spokesperson for the US State Department, said in a press release on Tuesday. “More drugs are coming out of Colombia right now than before he was president,” according to the US President. Trump’s swipe was the latest in a series of setbacks for Duque, who is under pressure from many sides regarding his handling of cocaine; the war crimes tribunal; indigenous protests across the country; his bid to restart aerial spraying of the controversial pesticide glyphosate; the government’s failure to execute a peace process, and other issues. The conservative Radical Change (CR) party jolted Colombian politics last week when it announced it would oppose Duque’s attempt to weaken the JEP, leaving the president with an even weaker minority coalition in Colombia’s Congress. Duque is openly pro-US and is the most recent in a long list of pro-American presidents. The president had even schooled, lived and worked in Washington D.C. for over a dozen years before becoming president. Trump’s criticism of Duque was especially out-of-tune with Colombia’s decades long role as the US’ strongest Latin American ally. For example, Colombia has been the jumping off point for Trump’s effort at regime change in Venezuela. Pompeo made sure to express US appreciation for Washington’s embattled ally. “The Secretary also thanked President Duque for the solid leadership of Colombia on the Venezuelan issue,” the release noted.